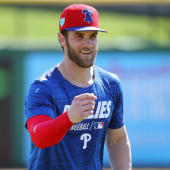 Harper's late arrival and cold start to spring gave at least some reason to worry that the slugger may start the season in a slump. If Thursday's exploits are anything to go by, he sure seems ready now, as his spring OPS soared up to 1.192. The outfielder has typically started the season hot, as he owns a .309/.436/.619 line through the end of April over the course of his career.